New Year’s resolutions can either be something that people look forward to or dread, depending on your experience with them. Perhaps you are excited to make changes this year and feel ready to do something different. Maybe you are nervous because past resolutions have failed, or the idea of making a significant change seems daunting. Add in life with a chronic condition, and that seems to complicate how to make and keep a resolution. I used to make resolutions, although I often found myself making them at the start of the school year instead of the new year. It made sense to me as a student, and then when I was a teacher. It felt like the start of the year to me, so that’s when I felt the most comfortable making my resolutions. 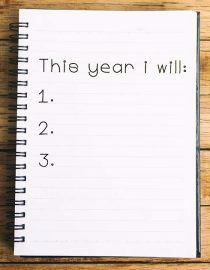 Now that I’m no longer teaching, I like the idea of making my resolutions at in January, with the rest of the world. This year, I would love to set myself a realistic goal for the upcoming year. So, that leaves me with the question. What are some practical New Year’s resolutions for people with chronic pain? It is important to set realistic goals that are practical and tailored to you. Everyone will be different, and be able to tolerate different levels of activity. Pick a goal that will work for your lifestyle, and then alter it to work for you. Getting more active doesn’t have to mean going to the gym, or working out every day. It could merely mean that you go for a short walk every week, work on gentle stretches, try some wheelchair/seated workouts, or check out some aqua workouts at your local pool. If you don’t want to spend any money, you don’t have to! Walking is free, and YouTube has a lot of great stretching, yoga, and seated workout videos that are great for all sorts of ability levels. Pacing is the art of planning out your day(s) so that you space out your activity. That way you have time to rest between things, and can avoid crashing because you’ve done too much in too little time. A good practice is to have a diary to plan out your days to help keep track of your activities. That helps you pace. Use your phone, a small paper planner, a wall calendar, whatever works for you! Add as much detail as you need to, as long as it helps you keep track of how busy you are and what your days look like. It can be so easy for those of us with chronic pain to become isolated. If you work, you might not feel up to go out afterward or on the weekend, or if you don’t work, you are further isolated at home. It’s important to try to maintain some social contact each week. It helps boost our mood and helps us feel connected to the world. Even if you can’t go out to meet a friend, you can talk to someone on the phone, chat with them online, or use a video chatting service like Skype to have a face to face chat over a screen. It’s the next best thing to seeing someone in person! Finances are a tricky topic that could take up a whole article alone, but when many of us are on limited budgets, getting into good spending habits is a good goal to have. If you find it all very overwhelming, it might be worth going to a trusted and regulated, advisor who can give you advice. It is also worth going over your accounts each week, and month, and then review your spending habits. There are also apps for your phone that can help you keep track of your finances, which could be helpful (see resources). If you do most of your shopping out and about, it might be worth taking out a set amount of cash each week, and working only to spend that amount of money. It is often easy to overspend on a debit/credit card, but when we see the cash disappearing from our wallets, we might think twice about overspending! There’s been a lot of self-care lately. It means an action specifically done to look after you. There is daily self-care, which ranges from things like eating and sleeping to taking medication, and there is what most people think of as self-care. That is stuff that makes us feel good or feel better. Self-care is highly individualized. For some people going for a run would be self-care. For others… that’s torture! Self-care can be many things: spending time alone, reading, going out with friends, getting a manicure, a bath, doing art, working out, put on a face mask, get take out, praying, etc. It’s just something that you will enjoy doing or will make you feel good. This goal is that you will practice self-care at least once a week. Schedule it in, and set aside a specific time in your week for you. To focus on giving yourself some care. You deserve it. Whatever goal that you decide on, it’s important that you tailor it for you. Make sure that you make it something that you are comfortable with, and that you feel like it is something that you can do. Set yourself reminders, either on your calendar or your phone, so that you remember to do whatever task that you have planned. That way you can keep on track with your goals. And remember, if you don’t meet your goals, that’s okay. Keep trying when you can, because you are worth it.